Studies done at the Harvard Medical School and the University of Colorado Health Sciences Center find that one out of ten women has some degree of low thyroid by age 50. Unfortunately this problem is largely overlooked by mainstream medicine and women are diagnosed with some other medical condition. Thyroid blood tests are notoriously inaccurate tools for diagnosis because there is such a fine line between a normally functioning thyroid and one that is underactive. A better solution, used by many holistic doctors, is taking your underarm temperature before rising in the morning. Shake down the thermometer the night before and take your temperature first thing before getting up. Menstruating women should take the test beginning on the second day of menstruation because that is when the body temperature is the lowest. Take an average of five days' readings. Dr. Broda Barnes, MD, who pioneered this diagnostic method, considered a temperature below 97.8 degrees F as a sign of hypothyroidism. However, Dr. Jonathan Wright, MD, uses a more conservative figure of 97.4, after observing that most patients above that figure were less likely to improve and more likely to have adverse reactions to supplemental thyroid hormone. Please visit our extensive reports on Hyperthyroidism and Hypothyroidism in our conditions section. 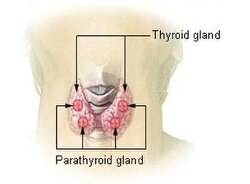 One of the causes of hypothyroidism is a deficiency of iodine. Iodine is essential for the thyroid gland to produce thyroxin, the thyroid hormone. Here is an inexpensive test you can do at home to check your level of iodine. This test can serve both as a diagnostic tool and as medication to solve the underlying problem. Buy a 2% tincture of iodine at the pharmacy, take a Q-Tip® and paint a spot the size of a silver dollar on your stomach or thigh. If your iodine level is normal, the patch will still be there after 24 hours. However, if the patch has disappeared in less than 24 hours, you are iodine deficient. Without the iodine there is no thyroid activity and this is why many people don't respond to thyroid supplementation. You will need to repeat the iodine application at different locations until it is still visible after 24 hours. If you are already taking supplemental thyroid hormone it will be necessary to see your doctor to re-adjust (reduce) the dosage to account for your body's own production of thyroid hormone the way it is supposed to. This may even result in the eventual elimination of the need for the supplemental thyroid hormone. This very simple method will not only diagnose the problem, but will get your thyroid functioning again. Repeat this iodine test every three to six months. In the meantime, take supplements with iodine, such as kelp (the highest concentration of iodine known) or eat iodine-rich foods, such as beef liver, turkey, asparagus, white onions and broccoli. Caution: Don't apply iodine more than once in a twenty-four hour period as you may experience symptoms of iodine overdose: heightened awareness, dilated pupils, and a metallic taste in the mouth. Estrogen-replacement therapy can make thryoid hormone less available in the bloodstream, thereby causing the hypothyroid symptoms. Using natural progesterone cream may well solve this problem. One of the signs of hypothyroidism is a lack of growth of the eyebrows, especially at the sides, or the loss of so many eyelashes that you have gaps. Hot flashes, insomnia and irritability are not just reserved for menopause. They are also possible indicators of low thyroid function, specifically Hashimoto's disease. Do you have aching wrists? Before you have surgery for carpel tunnel, have your doctor check for hypothyroidism, diabetes or arthritis. These ailments can cause pain and numbness in the arms, wrists, and hands.